Special thanks! to the many breeders, owners and Clubs worldwide, who donated use of their photos for this project. Their beautiful dogs bring this tutorial, and the breed standard, to life! You may view each dog's name by holding your cursor over the photo. A listing of photo credits is also provided. A Breed Standard is a written description of the ideal representative of a given breed. A breeder's goal is to breed dogs that most closely epitomize his or her perception of the ideal dog as described by the standard. A judge's goal is to evaluate how well the breeder has done in achieving the "perfection" described in the standard. And an exhibitor's goal is to present his or her dog to the judge in the best possible light, illustrating by appearance, condition, grooming and behavior in the ring, that this dog is an exceptional portrayal of it's breed standard of perfection. Breed standards are subjective by nature, and further complicated by the difficult task of putting a picture into words. This leaves much room for interpretation, so that no two breeders, or judges, will envision the perfect dog exactly the same. This is part of the challenge, and much of the joy of breeding purebred dogs. Each breeder has an opportunity to imprint his or her vision of perfection on the future of the breed. This tutorial was not designed to replace individual interpretation, but rather to provide a framework for breeders, judges and exhibitors who are new to the breed or simply want to learn more about the breed. Through photographs and explanations, the tutorial will provide a clearer picture of the perfect Cesky as described by the breed standard. It will also attempt to put the standard in the context of the breed's intended function, by examining how the traits described in the standard link to the breed's history, background and purpose. Using this Tutorial: Please read this brief section before you begin. It will guide you as to how to use this tutorial to best suit your needs and experience level. 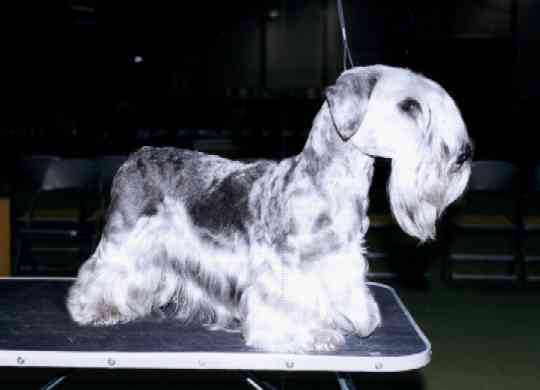 The Breed Standard: Presents the Cesky Terrier Breed Standard adopted by the American Cesky Terrier Club in 2000 (FCI standard in AKC format), with a brief introduction on why this standard was adopted. Why The Breed Evolved: Provides a history of the breed, why it evolved and its intended function. From Head to Tail: Explains the points of the Cesky Terrier Standard of Perfection, with photos to illustrate key points. Form Follows Function: Discusses how the standard for the breed supports the intended function of the Cesky Terrier. What's Unique About the Cesky: Explores some of the key ways Cesky Terriers are different from other terriers. Content, Design & Graphics Copyright © 2000-2002, Deborah Stevenson. Photos Copyright © 2000-2002 to Photographers.